Many clients I encounter have an opportunity to leverage some of the low hanging fruit that WebCenter Content can deliver to solve pressing business needs, but they’re often unaware that these features exist. For that reason I thought it would be useful to create a brief list a few of the most widely applicable and often overlooked features of WebCenter Content. It seems that the longer a customer has been using WebCenter Content (aka UCM & Stellent), the less likely they are to use this wonderful feature. 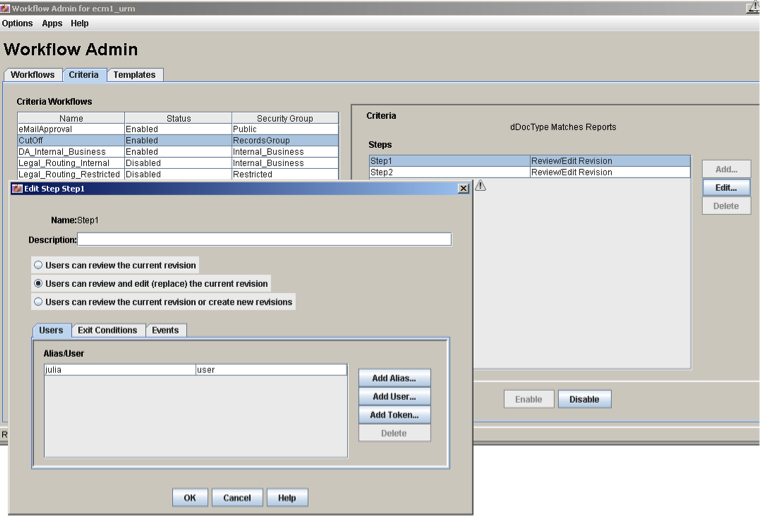 Oracle WebCenter Content: Desktop makes the connection between your PC and the content server virtually seamless. Windows Explorer suddenly has direct access to the content server folders and functions. Additional menus with special functions suddenly appear in Outlook as well. For legal and regulatory reasons your company may need to establish (and adhere to) corporate retention policies. With the 11g version of WebCenter Content, significant changes in the records management capabilities came along for the ride. Consider leveraging those capabilities to meet this need. Records Management allows you to organize information into a “File Plan” which controls how long you will keep content and what will happen to the content over its lifecycle. Suddenly your company will have control over how long it should keep content, what can still be maintained and what should be removed from the system. Additionally, it doesn’t matter whether the content is an electronic document stored in a PDF, MS Word or other electronic format OR whether the content is a physical piece of paper. There are capabilities to handle both physical and electronic records. Physical records includes such features as locations, billing, integration with Iron Mountain, barcoding and a reservation and check out system. To get started with Records Management review the following Oracle documentation. Virtually every organization has the need for some kind of content related workflow. It could be submitting and approving expenses, approving engineering changes, approving the verbiage on a marketing campaign or an endless array of other possibilities. WebCenter Content has a built in workflow tool which was designed to quickly address the common document approval situations while still providing a means for implementing more complex workflows. Building simple workflows and allowing the user community to access the workflow features via WebCenter Content: Desktop provides a quick and easy way to get up and running with little end user training. 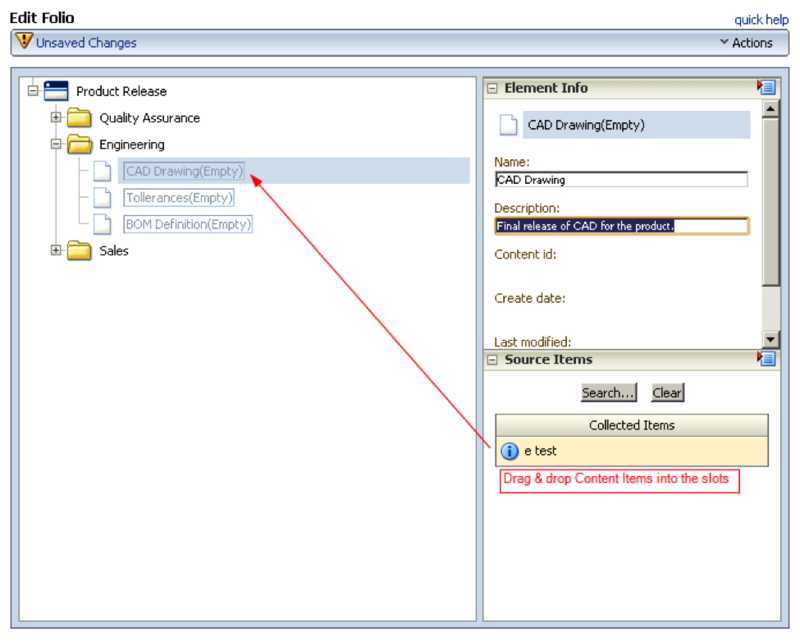 For more information on using workflows in WebCenter Content please refer to the Workflow section of the Oracle documentation below. There is often a need to group content items together logically within the content server. For example, a new product release may have instructions, warranty, product drawings, QA documents and dozens of other related content items that should all be grouped together for the release. A folio is a special content item that can be created to store related documents. There are two types of folios. A Simple Folio allows you to link a number of content items together while an Advanced Folio allows for the creation of a folio template which contains pre-defined nodes (folders) and slots within the nodes that contain content. A Simple Folio allows the addition of any content in any order and is a “flat” structure without any folders for organizing content within the folio. An Advanced Folio uses a Folio Template to create a predefined structure for storing content items including folders for organizing the content and pre-defined slots to hold specific types of content. When using an advanced folio, the user searches for, and then selects content items using a familiar WebCenter Content search interface. The selected content items are dragged and dropped from the Source Items pane into the appropriate slots as shown above. 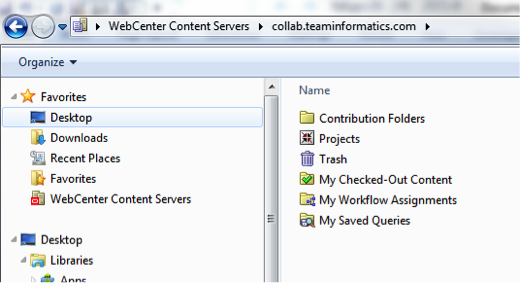 Once all of the content items are in place, the folio is saved to the content server. Getting the most out of your software is one of the easiest ways to bring value to a company, improve efficiencies and increase your return on investment. WebCenter Content can help you do that in many ways. If you would like more information on how some of WebCenter Content’s features may bring additional value to your organization please contact TEAM Informatics and see how the software you already own can be used in new ways to meet your current business needs. This entry was posted on Friday, May 16th, 2014 at 11:15 am and is filed under ecm, Oracle, WebCenter Content. You can follow any responses to this entry through the RSS 2.0 feed. You can leave a response, or trackback from your own site.